I saw a number of great shows last week, but the one show I missed turned out to be the newest designer to watch. Delpozo, a Madrid-based label, staged its first show during New York Fashion Week, and I heard from insiders like Lauren Santo Domingo that it was indeed a show-stealer. The line's creative director Josep Font, who drew inspiration from architecture and the Victorian era, featured pretty, elegant dresses (such as the one above), sculptural, voluminous skirts, jackets with sculpted shoulders and tops with exaggerated sleeves. There were also eye-popping color combinations of fuchsia, emerald green, burgundy and cinnamon, along with floral appliques, beading and embroidery. You can view and shop(!) 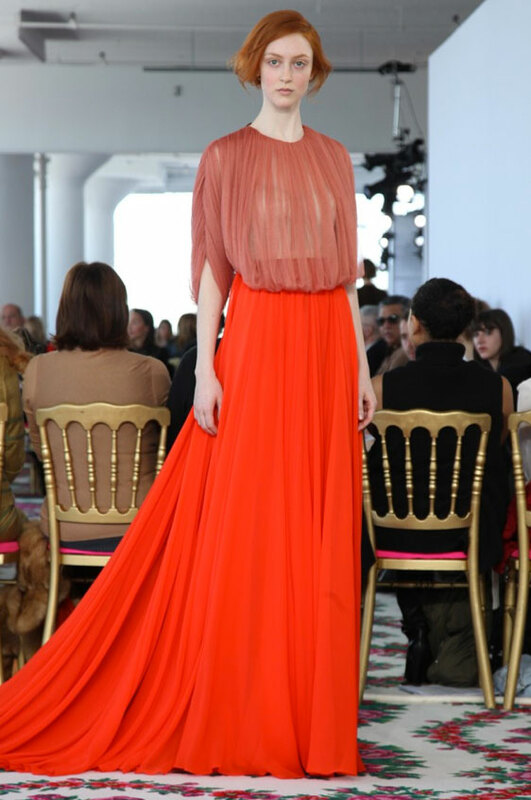 the entire Fall 2013 collection at Moda Operandi. (The trunk show runs through February 19.) Below are more highlights from the show. never heard of this label. gorgeous show! I LOVE this designer. One to watch indeed. These designs are spectacular.